In 2010, the group was approached by a photographer from Waverton and invited to share an exhibition of work inspired by the Alpine theme. These are the works which were created by our members. 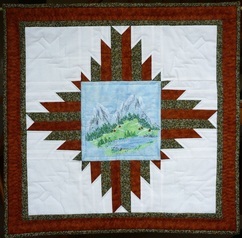 When I agreed to make a small quilt and the subject was to be Alpine related, I had to search my memory to remember what I had read or pictures I had seen to give me inspiration as I have never visited the Alps. 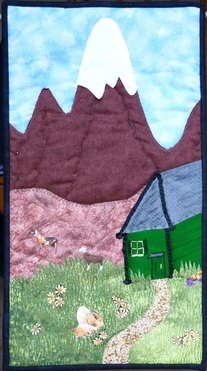 My memory was of mountains, log cabins, white flowers and goats roaming the lovely hillside. Every thing went well until I came to the goats and I had difficulty keeping these on the quilt as they leapt off. No worries if they take a wander again whilst in your care as I can replace them. Enjoy. Alpine suggests to me mountains, streams and trees. Fir tress and mountains lend themselves to triangles so I pieced these over papers and it grew from there. I loved the distance view and seeing the mountains rolling on. The whole was hand stitched and I really enjoyed using Oakshott fabrics which are a delight to sew. Hope you enjoy viewing the end result. Many years ago I visited Austria and came across a fabulous lake with the mountains and sky clearly reflected in the smooth dark surface. This memory was my inspiration. 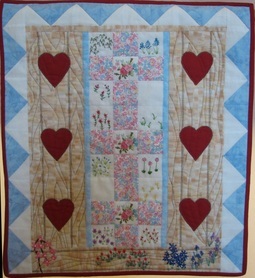 I started with the quilting design and then selected the fabrics from my stash. Although I designed a piecing pattern to reflect the landscape, simple strip piecing seemed to work best in the end. Machine pieced, machine quilted. 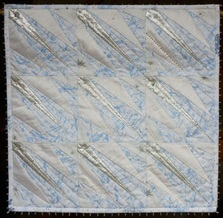 The first quilt I made was using the Delectable Mountains block. I was living in Texas at the time and had wanted to learn about patchwork and quilting so took myself along to a demonstration at a local quilt shop. I was hooked! I bought fabric and pattern, returned home and began to cut and sew. The quilt was so much fun to make. The blocks were fun to make and it all went together so quickly. 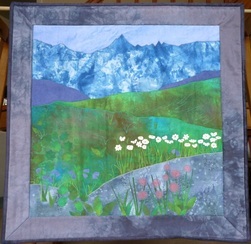 The Delectable Mountains quilt gave me the confidence to try other techniques and my love of patchwork and quilting grew. 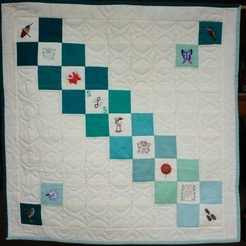 I gave my daughter the quilt and she treasures it – she has as much pleasure using it as I had making it. 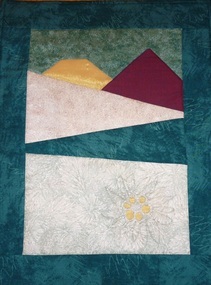 This quilt is part of my ‘Painting with Fabric’ series. Painterly fabrics are bonded and cut into strips with a pinked or wavy rotary cutter blade. The strips are used on the diagonal to create squares. 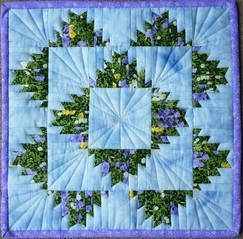 Decorative quilting adds texture and helps to hold the strips down. The Gentiana Alpina flowers are bonded and appliquéd, with dimensional stitching for added interest. 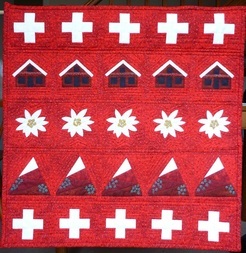 I have used the motifs/images that come to mind when thinking of Switzerland. I have visited several times in the Summertime, this is reflected in the limited colour range of reds & white, the Swiss colours. Foundation pieced and machine quilted. Constructed in 5 strips which were then joined by the Quilt-as-you-go method. 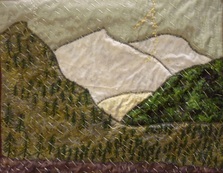 Visits to the Pyrenees in France and the Canadian Rockies were the main inspiration for the central machine embroidered picture in the quilt. 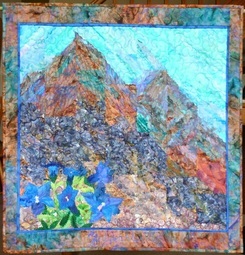 The idea of the delectable mountain blocks came from a discussion in a quilting group when I was trying to find an appropriate block to frame the picture. 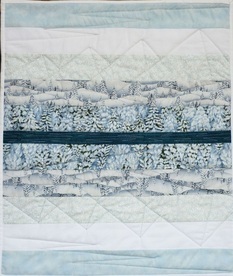 Fabric colours reflect the snow and trees of the areas. Techniques used: Free hand machine embroidery, machine pieced blocks and free machine quilting. 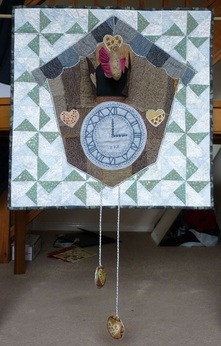 Firstly, it was made in response our retiring Chairperson's Challenge. Barbara Harrison had been such an exceptional person in that role, that I thought that making a piece of work would be a tribute to her. The actual picture is from an image in a Library Book, but it's also on the internet. My first pictorial landscape. Spray glue and 2-3 sorts of Bondaweb used. Heidi Stoll Weber dyed cottons, plus others, and net. As a child I loved the story of Heidi and there was a lovely and beautifully shot adaptation of the book on TV. I had always imagined that I might be Heidi. I’d wake up in the chalet attic with the sweet smell of hay bedding and look out of the window onto meadowland. I wanted to used as much of my stash as possible and found some 1970’s Laura Ashley prints. Of course in the event I ended buying more new fabric. My idea was a chalet window with a pair of heart carved shutters, overlooking spring meadows, which still had snow patches on them. 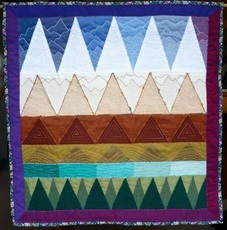 There is only a little quilting- the wooden shutters with heart carved out, the windowsill, and silver thread on white and blue triangle border to represent the ice still on the mountains. I googled Alpine and found the block on a site which I can't remember, but 'Alpine Cross' was found. Four blocks make the extra cross in the centre. Machine pieced and quilted. Blue/purple fabric reminded me of the Swiss Gentians. A wall hanging based upon personal experiences of the culture, folklore, flora and fauna centred on the mountainous regions surrounding La Paz, Bolivia. Techniques used in preparing the piece include hand embroidery and machine quilting, with the principal ideas of its content being based on my own photographs, taken during the course of an unforgettable trip to this extraordinary country. My Alpine memories are of the sharp snow covered superior looking mountains, always there feeding the lakes and lush valleys. It was a pleasure to design and sew this piece of work. Thanks to our Chairperson Barbara for the challenge. 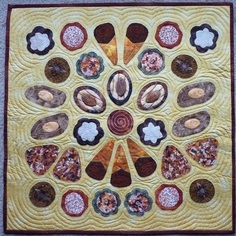 I attended a course called New York Beauty led by Judi Mendelssohn a couple of years ago and I have had a yearning to make a quilt using this technique ever since. I wanted to use white silk and silver sparkly fabrics to represent coldness but I couldn’t get good foundation piecing points because some of he fabrics were highly painted and ‘glittered’. Idea was abandoned, so worked using simple foundation technique. 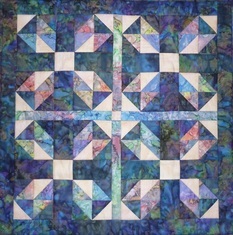 Machine foundation piecing, machine and hand quilting, bead embellishments. I hope it gives the impression of coldness. I have memories of the alpine flowers I saw on a summer holiday in Switzerland and I was inspired by the two lovely ‘icy’ fabrics to combine the themes of mountains and edelweiss in a simple block pattern with strong colours, where the gold of reflected sunlight on snow and rock is picked up in the gold of the edelweiss centre. The edelweiss centre is reverse appliquéd. 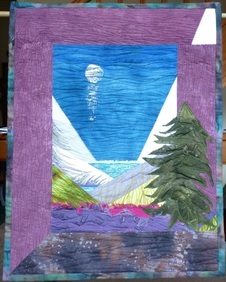 I chose to quilt simply ‘in the ditch’ to retain the contrast between the different fabrics. I spent a holiday in Lucerne with my parents and there was an enormous thunderstorm while we were staying there. 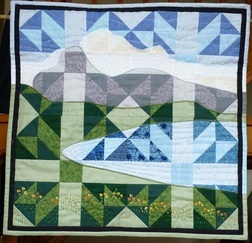 My quilt design is taken from a photograph taken by my father looking down onto Lake Lucerne with Mount Pilatus in the background. It took me ages to think of something Alpine that was outside of the mountain theme – I kept joking about cuckoo clocks and then thought – why not? Machine pieced, machine embroidered and appliquéd. Cuckoo engineering by my husband Terry who managed to work out how to do the spring.